Not that long ago, Banpresto funded the development of a rather insane Gundam arcade game called Senjo no Kizuna. The player would literally sit inside a panoramic cockpit and pilot a mobile suit. In addition, each of the hugely expensive cabinets would be connected via an online network to other such machines across Japan. Upon its release, Banpresto soon realised they’d cornered a new part of the arcade gaming market. As queues lengthened to play the game, the main draw wasn’t just the amazing cockpit but also its online capability. It wasn’t long until other publishers like Sega decided to get in on the act. Learning from Banpresto’s example, Border Break was birthed along with a new arcade board called the Ring Edge. Sega also didn’t miss a trick either, instead of having a theatrically huge cockpit they instead opted for a smaller and more standardised cabinet, whilst also upping the potency of the board that would run the game (as Senjo no Kizuna’s was suitably basic in a graphical sense, which is why its PSP port was even feasible). However, to classify Border Break as a mere herd following cash-in would be a great injustice. To be perfectly frank, Border Break is probably one of the most refreshing mecha games seen this decade. At its core Border Break is a resolutely multiplayer focused shooter, taking heavy influences from games like Battlefield and Armored Core. The game is split into two teams of 10 a side, with the main objective of destroying the opposing team’s base. Though this may sound easy, the core of each base is heavily armored from aerial attack, so you literally need to be underneath it in order to inflict any damage. Not to mention that each base is brimming with remarkably potent defenses, means that taking one down is by no means an easy endeavour. In addition, there are multiple spawn points along the route and capturing these is integral to gaining ground through the map. To anyone that has played Battlefield, this will all sound pretty familiar and much like in Battlefield, Border Break’s interpretation is equally robust. The controls would also be very familiar to any PC gamer, as the cabinet sports a joystick and a mouse. The left joystick controls movement, boosting, jumping and crouching – the latter also doubles for context sensitive actions (such as using a repair station or a magnetic catapult) and the right mouse controls looking, firing, weapon selection and a target camera lock. However, despite all these apparently almost standardised elements Border Break manages to riff off them to create something wholly new. This is more than anything else due to a fantastically clever touchscreen interface, as you can literally point to any part of the game world and give commands to your team mates, such as defend this position or capture this spawn point. You can also point to your mecha, called a “blast runner”, and tag it asking for assistance such as ammo or health replenishment. Other facets, like the mortar, allow you to specifically pinpoint areas on the level map to bombard. The entire interface, from its joystick to the mouse and finally the touchscreen is inherently tactile. What differentiates Border Break from the PC shooter crowd more than anything else, is that the blast runners retain their weight as well as a boost dash. Most mecha themed first person shooters, such as Shogo, don’t really differentiate their human protagonists from their mechanical. Border Break approaches the blast runners as mecha in an outright sense. Much in the same way Battlefield shifts control from vehicular to that of a human, Border Break merges both to give the sense you’re piloting something really quite beefy. The dashing is also very much a mecha staple and unlike Virtual On, which is based around fixed vectored dashes, Border Break uses a more analogue approach so you can change direction on the fly. What transpires is that without boosting, your blast runner plods along quite slowly but when you start to dash you also retain momentum. Couple this with the jump and you can, with a little practice, use the blast runner’s momentum to carry you further. More advanced usage takes it further still, using the initial acceleration and momentum on a boost to almost “hop” around, in a manner not to dissimilar to the quick boost function seen in the newer Armored Core games. Naturally, boosting is finite as your boost gauge depletes with usage. In addition, your weapons loadout and chassis parts effect the weight of your blast runner and its top speed as well as acceleration, though more of this later. Sega have also been very shrewd in how you pay for all this. Credits are accrued as “game points”, or GP, and these slowly tick down on a timer. Once you run out that’s the end of your game. The GP system also applies to the time you spend in the front end, though you do have a brief grace period. Though the really cunning use of GP is how you customise your blast runner. Much like in Armored Core, you can customise not only the mecha’s frame but also its weapon load out. Apart from requiring certain raw materials to “make” a part, which are awarded at the end of each match via a random draw, you also need pay for each one with GP. That’s right, you literally pay real world money to upgrade your blast runner. It’s a clever system, as everything feeds back into your GP in one way or another and it never feels as though you’re being fleeced for every 100 yen coin you own. Much like in Armored Core, each part of the chassis and weapons affect your overall weight. This effects your blast runner’s speed and acceleration in ways both subtle and profound. Though unlike Armored Core’s somewhat dizzying array of numbered statistics, Border Break’s parts are more straightforward in their effects. This is mostly down to the simplification and reduction in the number of parts categories, as well as the four classes each of the blast runners sit within. One element that is also quite interesting is that switching between your four potential weapons whilst very direct, as it lacks the scrolling dead zone selection seen in the earlier Armored Core games, each weapon has a very nice mechanical animation for its selection. This means you never select the wrong weapon but you can time your selection poorly, as it’s not recommend to switch from your machine gun to your rocket launcher in the middle of a fire fight. As such you’re always mentally preparing each weapon for each encounter, which adds a welcome layer of tactics to the proceedings. As this is something that is very much lacking from the reflexive nature of most modern day shooters. One of Border Break’s more arcade defining qualities is its use of four distinct classes; assault, heavy, sniper and support. These are selected prior to each time you spawn and are customised separately in the game’s front end. Initially, you only have access to the assault class but through extended play more classes become available. The assault is your main staple, relatively fast and with a good emphasis on melee. Your blast runner’s sword is more manual than you’d expect though, as there is no target lock as such (only a camera lock), this means you can often over shoot your enemy with a sword swipe, leaving you suitably open to attack in the process. The sword is very potent and once mastered can be quite terrifying when you’re on its receiving end in an enclosed space. The heavy is more your full on ground pounder, equipped with a heavier machine gun initially as well as a rocket launcher (whose shots have a nice area of effect on impact). Though these weapons serve you well in a fire fight, the heavy is meant more as a mid to long range blast runner, as the mortar is used to clear areas on a map so the other team mates can control that area easier. The heavy also sports an ECM grenade that jams an enemy’s display, again allowing your teammates to take them out with greater ease. The sniper is pretty much what you’d expect but also quite nimble and woe betide you ignore an entrenched sniper. It also can deploy a fixed position machine gun turret, which is very useful if you need to leave a guard dog on a spawn point whilst you reconnoitre ahead. Finally, the support blast runner is one of the more interesting types, as not only can it heal team mates in the field but also drop very powerful mines. Its shotgun is also incredibly good in an enclosed fire fight. No game is without its faults however, Border Break’s are relatively few though. Most notably of which is the mouse’s incredibly short cable, as you will initially be pulling on it much like you would on a PC back home only for it not to give way. In truth, it can be quite annoying initially but after further play you adapt to make smaller and more precise movements, which arguably suit the game more as you then use the boost dash as it was probably intended. Secondly, whilst this is a game using a new Sega arcade board it’s not exactly graphically cutting edge. By no means is it ugly but compared to many 360 or PS3 games, Border Break looks a bit dated in places (though not in the mecha department, as they all look pretty fabulous). That said, most modern console games don’t run at 60fps nor promise a lag free online setup (not to mention most are upscaled from a non-HD resolution these days), so whilst the environments have some texture tiling in places it’s forgiveable considering how fluidly the game operates on a functional level. The final issue is ultimately Border Break is an expensive arcade game, some may have issue with paying for gaming time rather than a credit that you can hold onto via your skill alone (much like Virtual On or any other arcade versus game). Not to mention having to pay for your blast runner’s new parts with actual cash could rub some up the wrong way. The truth is that in this department your mileage will vary, we found no issue with the approach to game currency but we do appreciate that money doesn’t exactly grow on trees either. Regardless of these faults, Border Break doesn’t labour under them in any real way. As the game is functionally very well crafted and that alone is a refreshing enough to render the above issues a tad moot, in our eyes at least. Though the truly striking thing about Border Break, more than any other, is how seamless the game integrates a Western design approach for a PC shooter with the very Japanese rule sets that ensconce its mecha mythos. You’d think that Western developers would have nailed this long ago but Sega have done what many probably thought to be wholly incompatible; a standardised Western approach to controls with the bespoke nature of Japanese mecha. It’s an impressive achievement and one that will most likely be completely overlooked, as there are currently no plans to release Border Break overseas. This would be an obvious shame and whilst a console or PC port could graphically keep up with what Sega’s new Ring Edge board is pumping out, the touch screen controls are very much integral to the immediacy of the overall experience. Plus, sitting in an arcade and taking down an enemy’s base alongside a gaming compatriot and then seeing both your and their blast runner’s punch the air with their mechanical fists is a sensation that games played in the comfort of your own home still really lack. 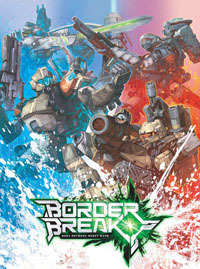 Border Break, as an arcade game, is therefore nigh-on faultless in terms of its place amongst similar brethren from the mecha gaming pantheon but whether that would make the leap to any kind of port, motion sensing controls or otherwise, remains to be very much seen. What Border Break does though is renew an element of faith that was once somewhat lost after the decline of Sega’s much loved Virtual On series. As a game then it’s not just simply good but a thoughtfully crafted affirmation of why mecha games exist in the first place. Ohhhh…. what I miss most about not being in Japan anymore… wasting yen on Border Break. Excellent read. Good luck with mecha damashii, dude. Loved this article. However, perhaps you could bring BB here in the US such as Dave and Busters…there are still arcades, just not at the level of years ago. As much as I wouldn’t mind a 360/PS3 port…I still feel that this is something to be played on an arcade machine in an arcade, especially with the controls. Still, Sega did port VIRTUAL ON and OUTTRIGGER to consoles with pretty solid results, and both of those games had unusual controls. Still need people’s help essentially yelling and throwing demands at SEGA to bring it out to the states or even a world wide release. Been working at it off and on over the years. What’s been warned has begun. The buzz about it seems to be dying down. They’re going to suffocate what they can do with it if they leave it in japanese arcades. Sega needs to make a move probably within next year or this could be it. The selling of re hash alone while they keep the good stuff in japanese arcades is NOT going to cut it. Wow. This game look fun. Might be spiritual successor to Virtual On, but more players and large maps. I should try it out if I live in Japan.